Before Passover this year, our office mate Avi sent me a recipe from his grandmother, Riva Schamroth; it was a rhubarb and strawberry compote, and he asked me to try it out -- it's a dish he loves, and he was convinced it deserved a mention on food52. The second time around, I added less sugar (I used turbinado, which I think gives the compote a caramel undertone), infused the compote with some orange peel, and splashed in a glug or two from the open bottle of rosé that was lying around in my fridge -- I can't tell you why, it just seemed like the right thing to do. The compote, cooked just until the fruit started to fall apart but had not yet become a complete mush, was tart and fresh, perfumed with the oils from the orange peel, and it had just enough sweetness to keep your mouth from puckering. I ate mine over the course of a few breakfasts, over both plain Greek yogurt and ricotta, but I bet it would be pretty g ood over ice cream too. I'm a native New Yorker, Le Cordon Bleu graduate, former food writer/editor turned entrepreneur, mother of two, and unapologetic lover of cheese. It also makes a superb cobbler or crisp. Just add 4 tablespoons of tapioca granules or starch, and your favorite crumb or crust topping. YUM!!! 350 degrees for an hour. The best breakfast ever with greek yogurt! I've been making this for years, also from my grandmother's recipe. They are a natural combination since they are in season the same time. I also reduced the sugar quite a bit, added orange zest, but I added a bit of cinammon, a pinch of fresh ginger and 1/8 tsp of freshly grated nutmeg. It adds layers of flavors to the finish. Made this last night to accompany Louisa's cake...so, so good. The raw sugar instead of granulated is so clever...makes a big difference in the taste. I'm thinking of using the leftover compote to make a strawberry-rhubarb shake. I've served a similar compote with the almond cake recipe from Bouchon...so good. I am with you Merrill - I often splash a little of whatever I am drinking or what is in the fridge into whatever I am making. Wine improves most everything! sounds delish.. but what also got my attention was this lovely glass pot that I see starring in may of your winning recipes.. Any pointer where I could buy one of these ? I agree; where can we get the glass cups?? 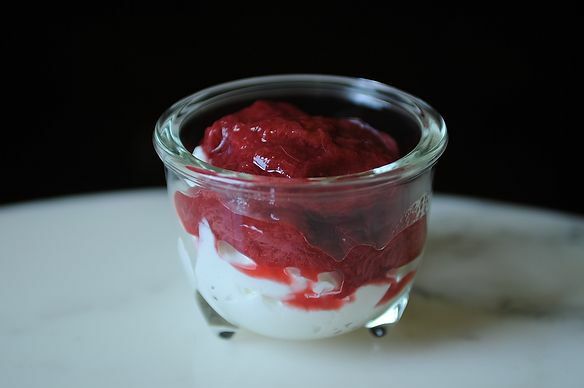 This compote over greek yogurt sounds divine. And I'm love with these glass custard cups, which I've seen in several pictures across the site. Where are they from? I agree with both counts: recipe looks delicious and would love to know where these glass cups come from, they look so sweet. My favorite thing to do with simple rhubarb compote is to put it over plain yogurt with some crushed up English-style Flapjacks [like this recipe, similar to the recipe I use: http://www.food52.com/recipes/4159_moms_flapjacks] and a drizzle of honey. I can only imagine how much better it would be with this version. They're Amanda's glass cups, and I think she got them in Germany -- I'll have to double-check with her, though. Aren't they great?